​​​​​​​DALLAS – Pioneering bankers and private equity investors in the Dallas-Fort Worth area have noticed that more people are buying boats for newly busy lakes, replenished from past droughts, as the economy has rebounded. And they need a place to put them. 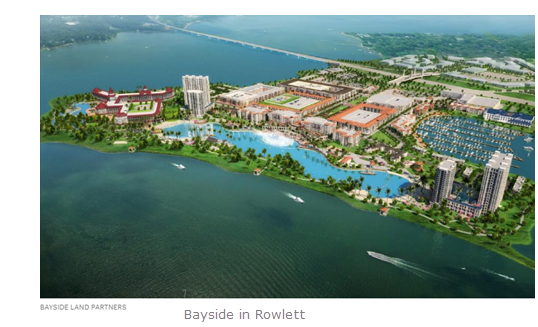 Rowlett​'s Bayside (shown below) is a $1 billion project will that include a resort, hotels, luxury living and retail and restaurants. Bayside will also include a blue lagoon with a massive water fountain. ​Financing marinas on a lake or an ocean front property in past economic boom times were typically one-off deals. ​Traditional financiers would usually run from them. They were seen as easily ​susceptible to downturns, with default rates nearing the low teens, according to Small Business Administration data. Boats and other luxuries are the first thing to go overboard when the economy slips after all. There were problems with storms too. Most financiers would back marinas in a single area. One hurricane or storm would wipe out entire portfolios that were only discovered too late to be heavily concentrated geographically, and the defaults would run aground. But in the last two years, the Metroplex has emerged as a global source of financing for these projects. The financial engineers have figured out how to better underwrite loans for marinas and to cover enough diverse locations to absorb any losses caused by Mother Nature.